Agelbert NOTE: Oh the irony; a TANKER powered partially by (wind) Renewable Energy. Finnish clean technology group Norsepower announced Tuesday that its innovative Rotor Sail Solution has received the first-ever type approval design certificate granted to an auxiliary wind propulsion system onboard a commercial ship. The type approval from leading ship classification society DNV GL was issued in February 2019 after a design assessment of Norsepower’s 30-meter by 5-meter Rotor Sail, two of which have been installed onboard the Maersk Pelican LR2 tanker. Norsepower says the landmark certification means that vessels operating its Rotor Sail technology are technically capable of safely navigating “all operational and environmental situations”. The company’s Rotor Sail Solution is a modernized version of the Flettner rotor; a spinning cylinder that uses the Magnus effect to harness wind power to propel a ship and enhance fuel-saving. 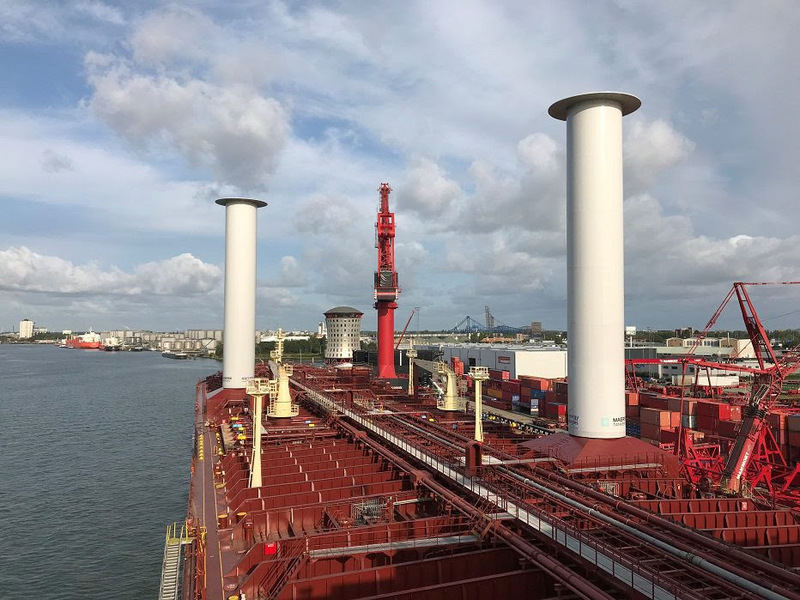 Rotor Sails have already been installed on three vessels and has achieved over 35,000 hours in operation, saving more than 4,500 tonnes of CO2, according to Norsepower. The solution has also been independently verified to reduce fuel consumption by up to 20%. Last month, Norsepower was crowned the winner of the 2018 International Quality Innovation Award in recognition of its Rotor Sail Solution technology’s ability to demonstrate positive environmental contributions. “To help reduce shipping’s environmental impact we will need many different fuel and technology options, which is why we were very pleased that Norsepower asked us to be part of this innovative wind propulsion project,” said Geir Dugstad, Director of Ship Classification and Technical Director at DNV GL.